Chapter 7 bankruptcy is a process that gives you the opportunity to make a fresh financial start. Our Los Angeles and Orange County Chapter 7 attorney will help you to eliminate all of your unsecured debt, such as credit cards, most personal loans, student loans, medical bills, collections, it will also eliminate wage garnishments, lawsuits, and deficiencies or a balance on repossessed vehicles. The filing of Chapter 7 bankruptcy is a complicated procedure. The Law Offices of Raymond Perez will process your whole bankruptcy petition based on current Bankruptcy Law and guidelines with the goal of a discharge issued by the Federal Court. Filing Chapter 7 bankruptcy normally allows you to retain your property, in addition to freeing you from your enormous debt. You may be able to make arrangements to reaffirm the debt if your mortgage payments and car payments are current and if there is significant equity in your property. 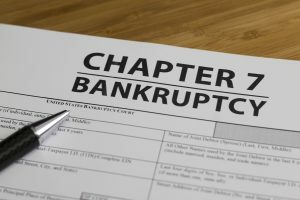 The purpose of Chapter 7 bankruptcy is to allow you to keep your home, your car and your personal belongings, but eliminate your enormous debt. When you call for your initial phone consultation, you will get reliable advice from a compassionate and experienced staff who really care. We can help stop credit agency harassment, wage garnishments, and account levies. After you obtain your bankruptcy discharge from the Federal Court you can start re-establishing your credit within months and in 2 years you may potentially consult a real estate office for the purchase of a home, although Chapter 7 bankruptcy can remain on your credit report for up to 7-10 years. We have 25+ years of experience in all facets of Chapter 7 bankruptcy. We will fight hard for you and be your caring advocate throughout the entire bankruptcy proceedings. Our attorney, Mr. Raymond Perez will be next to you throughout your court hearing and represent you. To get all the full details and to answer every one of your questions, call our office for a phone consultation today.